4 680 Jordan Hasay USA 4:13.95 . 5 540 Ioana Doaga ROU 4:14.27 . 7 446 Nelly Chebet Ngeiywo KEN 4:18.50 . 8 589 Amela Terzic SRB 4:19.03 . 9 128 Jennifer Wenth AUT 4:22.39 . 10 162 Genzeb Shumi BRN 4:23.90 . 11 505 Rebekah Greene NZL 4:27.75 . SHE has long been heralded as 'the next Sonia' and Down schoolgirl Ciara Mageean showed why yet again by sensationally winning 1,500m silver at the World Junior athletics championships in Moncton, Canada yesterday. 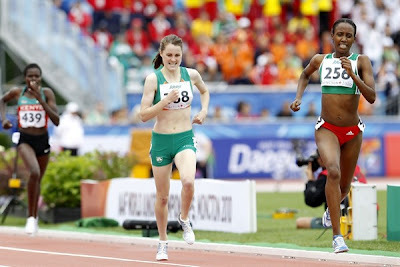 Mageean, coached by Eamon Christie at Lisburn AC, was one of only five Europeans to qualify for the 1,500m final and, as expected, found herself in a ferocious tussle with five African runners who set a blistering early pace of 44 seconds for the opening 300m and 61 seconds for the first lap. But at the bell, it was Mageean and Itzita Bogale who pulled clear and the gold medal came down to their thrilling sprint over the final 300m, with the Ethiopian just nicking it in a personal best time of 4:08.06. Mageean's silver-winning time of 4:09.51 knocked a whopping six seconds off her own Irish junior record and third-placed Kenyan Nancy Chepkwemoi also ran a 4:11.04 personal best. Mageean's time was the eighth fastest ever by an Irishwoman and she is still only 18. "I'm so proud, it's Ireland's first ever medal on the track and I just wanted to do it for everyone back home," the delighted Portaferry star said. "I'm thrilled, too, to finish with a national record, I knew I was in it on the final kick." Last summer Mageean won an 800m silver at World Youths and took 1,500m gold at the European Youth Olympics. World Juniors are the accepted barometer of future senior international success and it was Ireland's first medal at this standard.